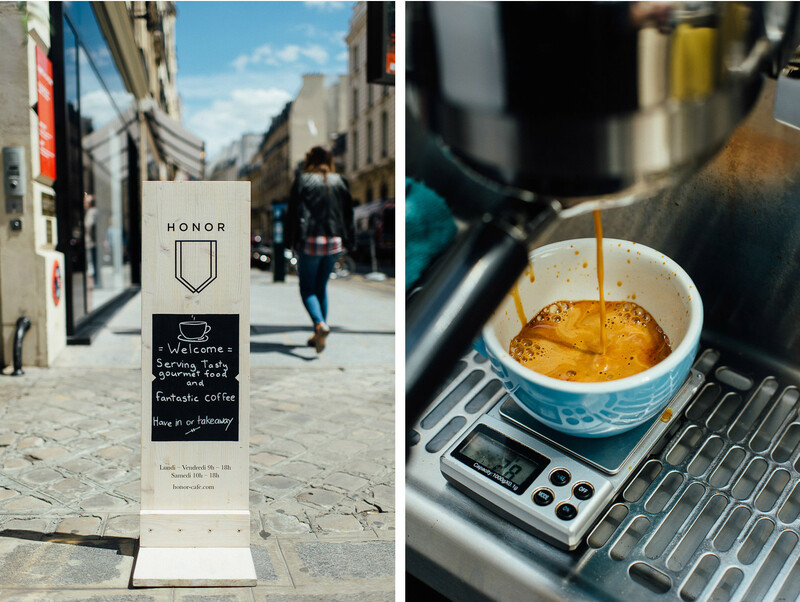 It’s no longer hard to find good coffee in Paris. Lomi, Ten Belles, CREAM, Holybelly—the list of places to drink impeccable joe happily goes on. 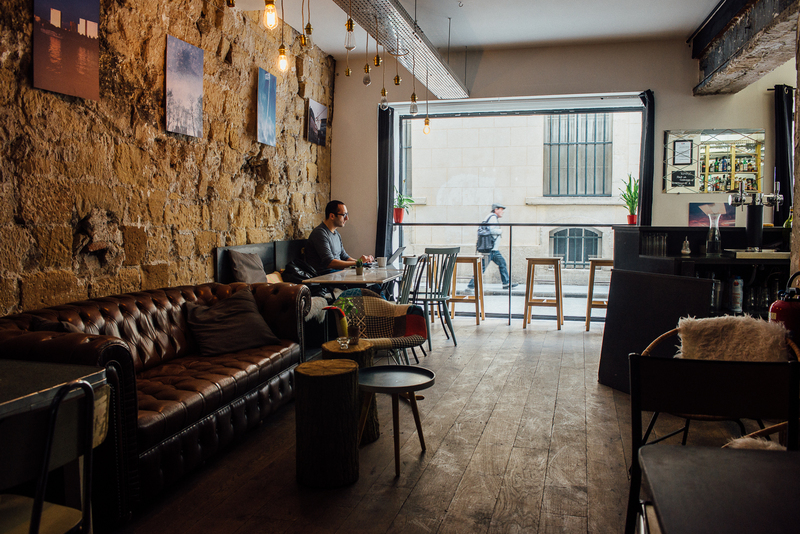 For those who have hit up all the traditional cafés, a growing selection of “concept” cafés offer novel spaces in which to savor a cup of java. 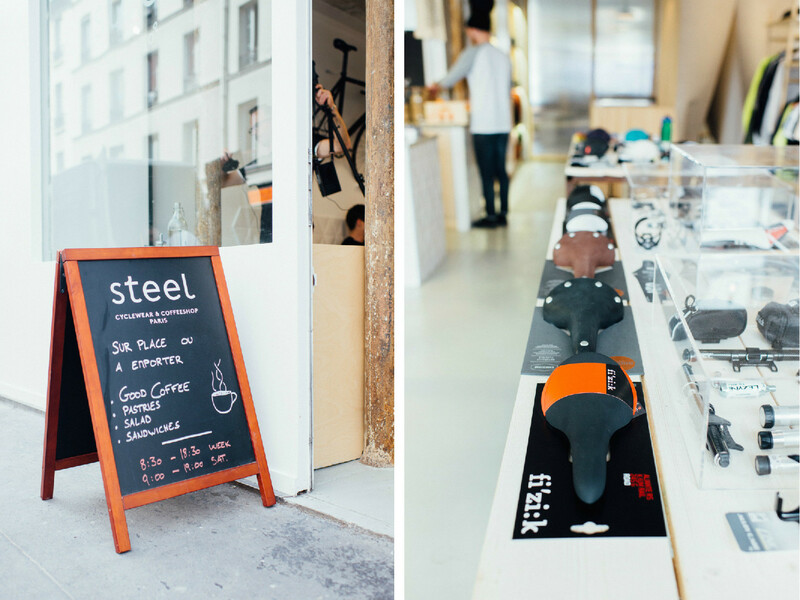 The newest addition to the Paris café circuit is part caffeine pitstop, part bike gear showroom. 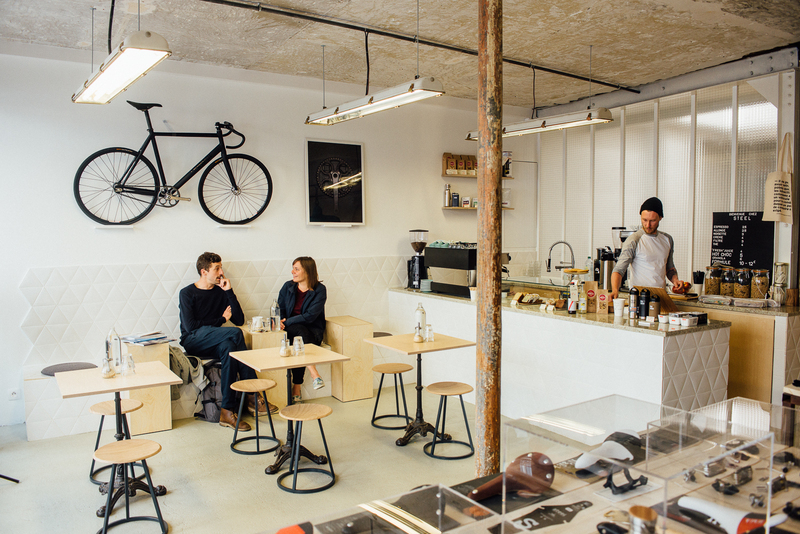 Beans from Belleville Brûlerie deliver the kick, while homemade sandwiches, sweets, and granola provide the fuel at this concept store opened by lifestyle cycling magazine Steel. 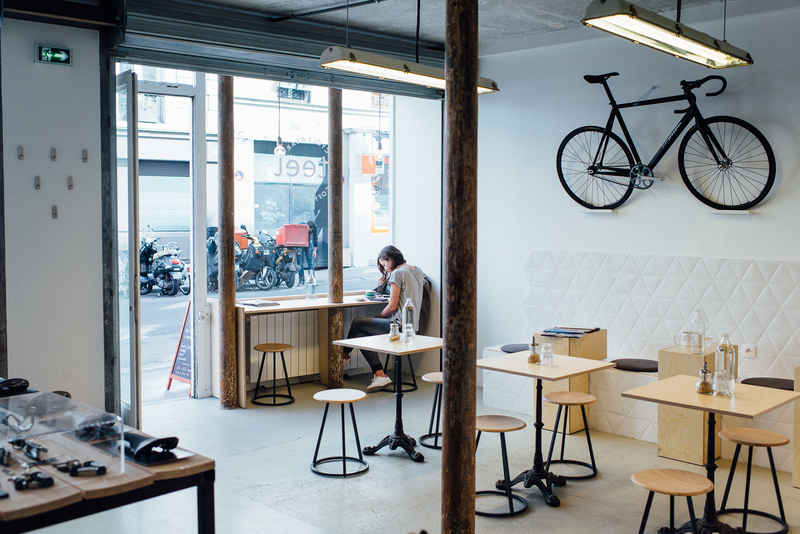 Racks of sleek biking gear and a pair of high-performance two-wheelers on the bare walls give the (rather severely) minimalist concrete-and-wood seating area a touch of color. The lovely tangle of sophisticated machines on the bike rack outside attests to the café’s popularity with Paris’ growing cycling scene. 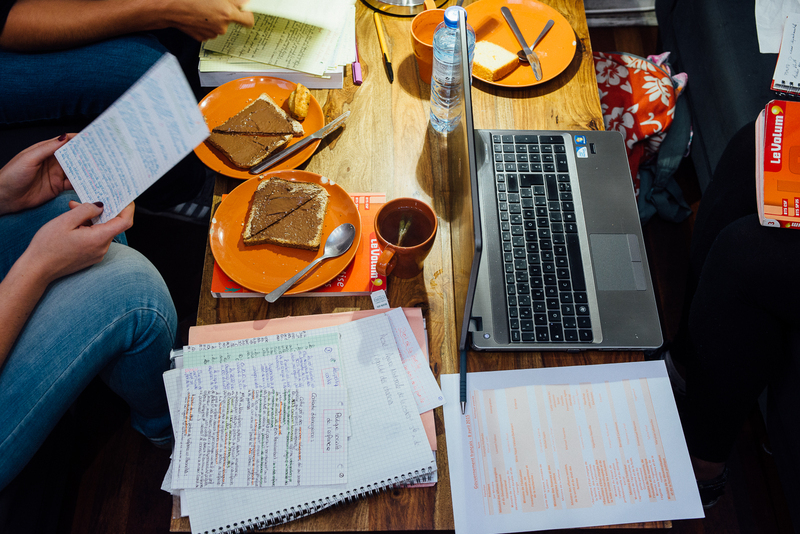 Subdued lighting, low music, and unlimited snacks make this café a perfect base camp for all-day work sessions or rainy afternoons spent playing Risk (a shelf in the back is stacked with boardgames). 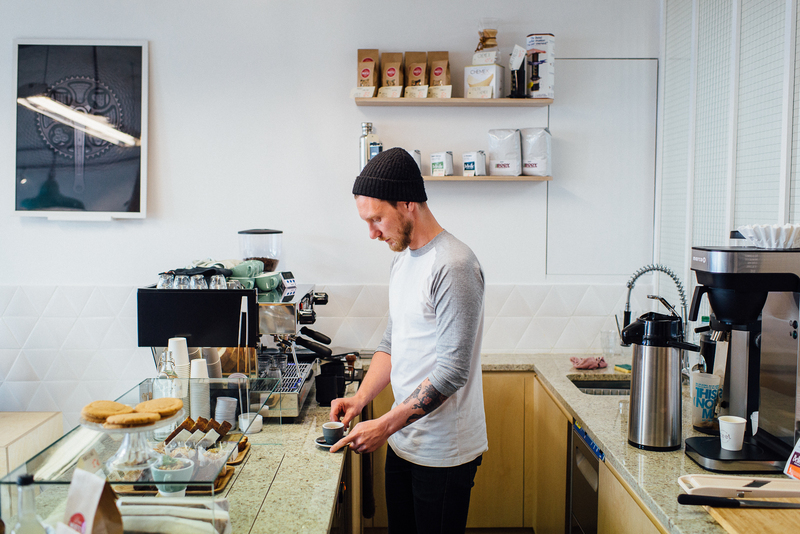 The concept is simple: you pay for time, not espressos. Four euros get you an hour and unlimited coffee, tea, pound cake, pretzels, fruit—whatever’s on the smorgasbord that day. Large wooden tables and gentle lighting make it a great place to get work done; you’re as likely to run into a group of business students discussing their startup as you are to end up sitting next to a jeweler stringing beads. The eclectic atmosphere encourages exchange, but manages to foster concentration at the same time. 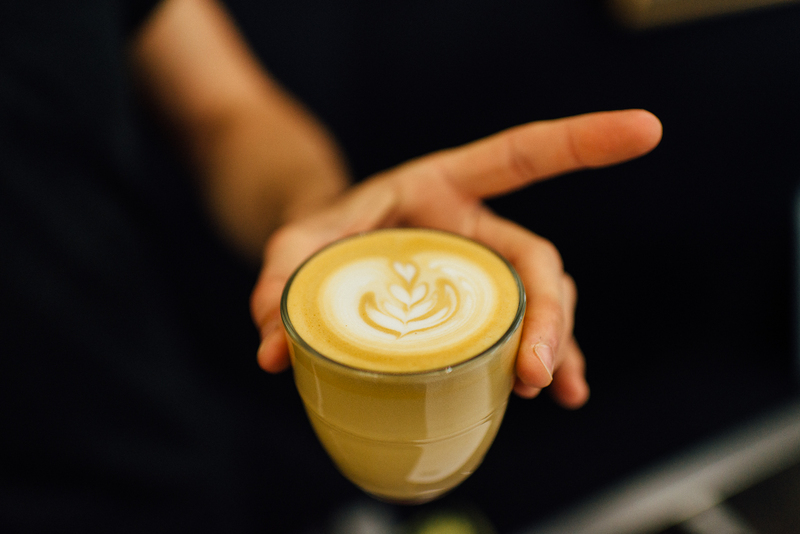 The coffee itself is nothing to write home about, but the concept is worth trying. Coffee or cocktails? At aveK, the answer is obvious: both. Opened just over a month ago, this café by day morphes into a cocktail bar come apéro hour. 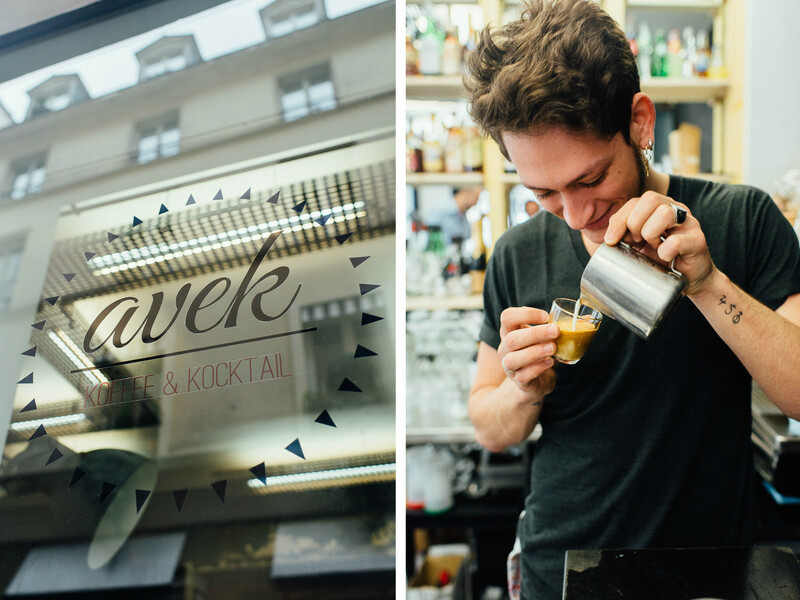 Its location, just a few strides from the Experimental Cocktail Club, could make for tough competition, but aveK is clearly doing their own laid-back thing, with minimalist Scandinavian-vintage decor and more daylight than boudoir glow. 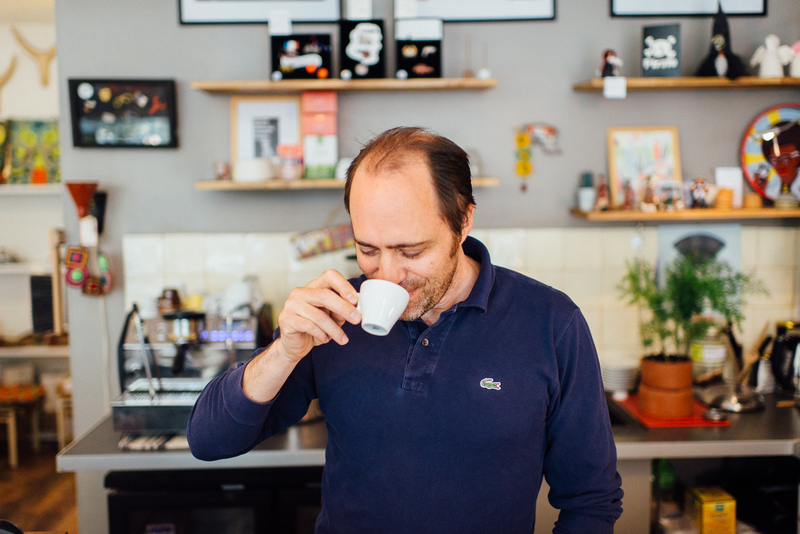 The coffee is from Lomi and a note on the menu begging customers not to order a mojito or caipirinha—the default in many Parisian bars—are signs that they intend to take both coffee and cocktails seriously. The alcoholic options are refreshingly affordable; a house speciality like the rose-petal-topped Gin Tea or spicy Little Mary is 8E, or 6E during Happy Hour. 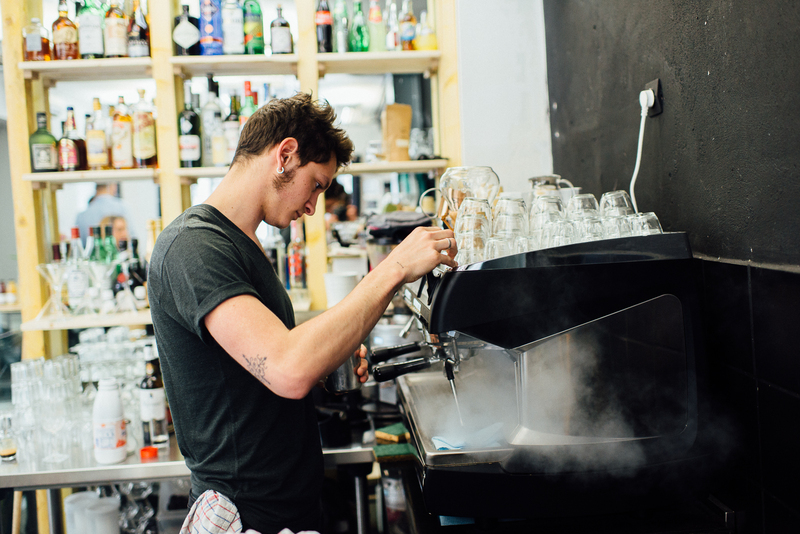 English-Australian couple Angelle Boucher and Daniel Warburton opened this outdoor coffee cabin three months ago, after several years spent managing cafés in London. 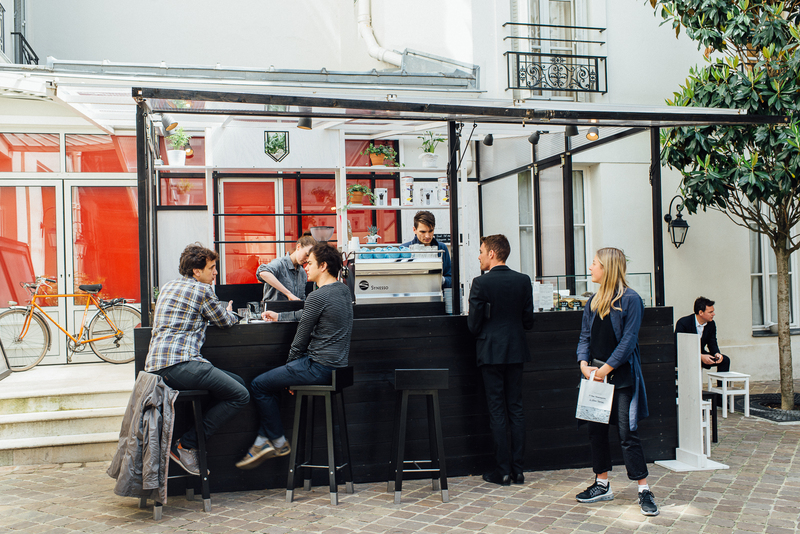 Located in a quiet courtyard off rue Faubourg Saint Honoré, the café’s simple black-and-white design is in keeping with the elegance of the neighborhood—the outdoor space is rented from Comme des Garçons. 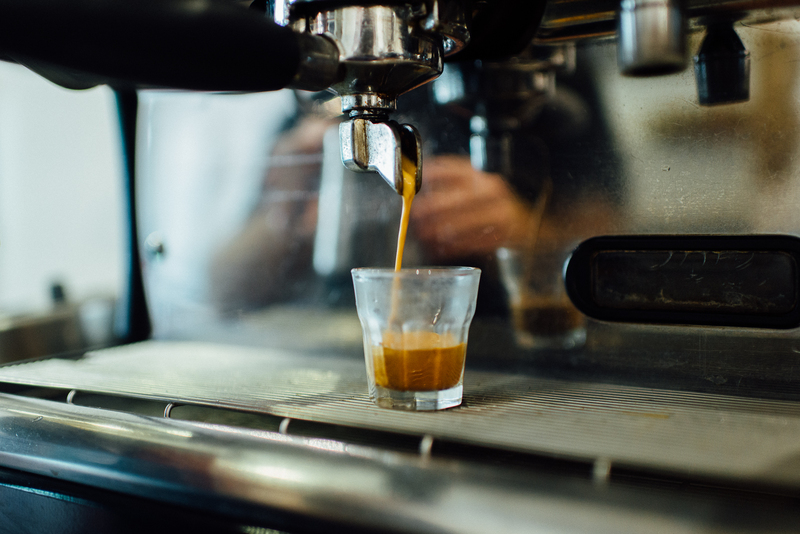 Lunch options include homemade quiches and sandwiches, while a Sicilian cookie or chocolate moelleux with coffee frosting are decadent sidekicks to a flat white or espresso. Coutume’s special-order seasonal blends are a welcome addition to this otherwise coffee-poor neighborhood. 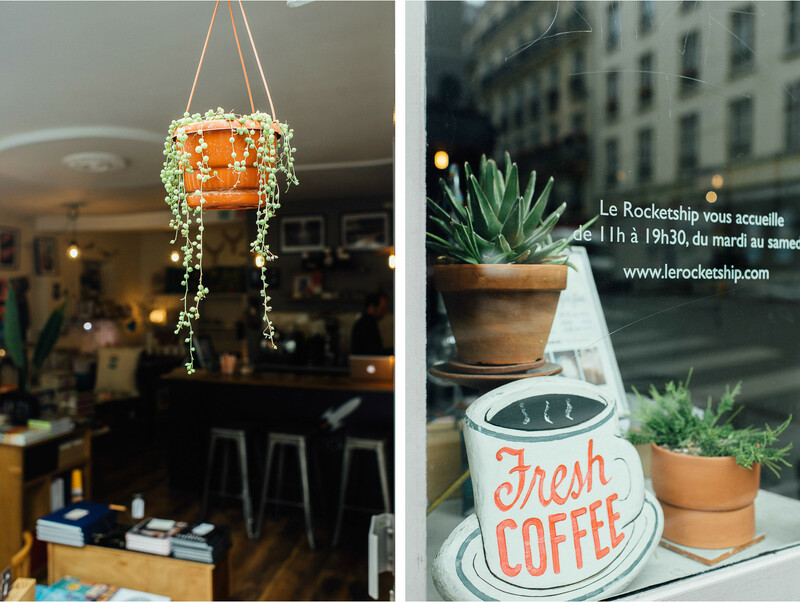 Benoît Touche presides over his eclectic selection of home decor, stationary, and random delightful grown-up toys from behind a small counter where customers are welcome to pull up a stool and stay a while. “If they just want to sit and have a coffee, that’s fine. Or if they’re interested, we can talk about the stories behind the objects that interest them. Everything here has a story,” he says. Just as the coffee from Coutume is artisan roasted, so the quirky finds lining tables and shelves and livening up the walls are designed and made with quality and originality. His latest coup de coeur are hand-made letterpress cards from People I’ve Loved in San Francisco. You won’t spent a day camped out with a laptop and endless cups of coffee here, but you may wile away an afternoon picking out a pièce de résistance for your living room. More info here. Belleville has its own craft-roasted coffee. If you’re in the neighborhood don’t miss CREAM. Kate also checks out Brew Unique, Paris’ first brew-your-own craft beer studio. 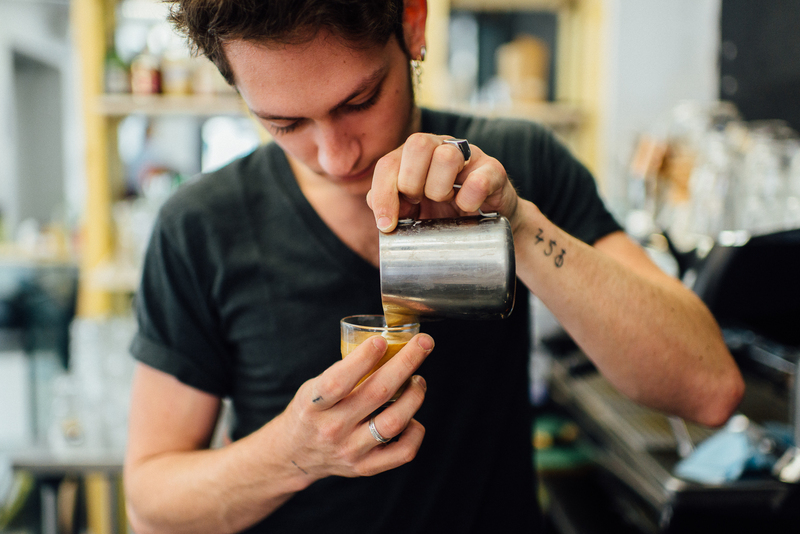 Artisan coffee and a great weekend brunch? 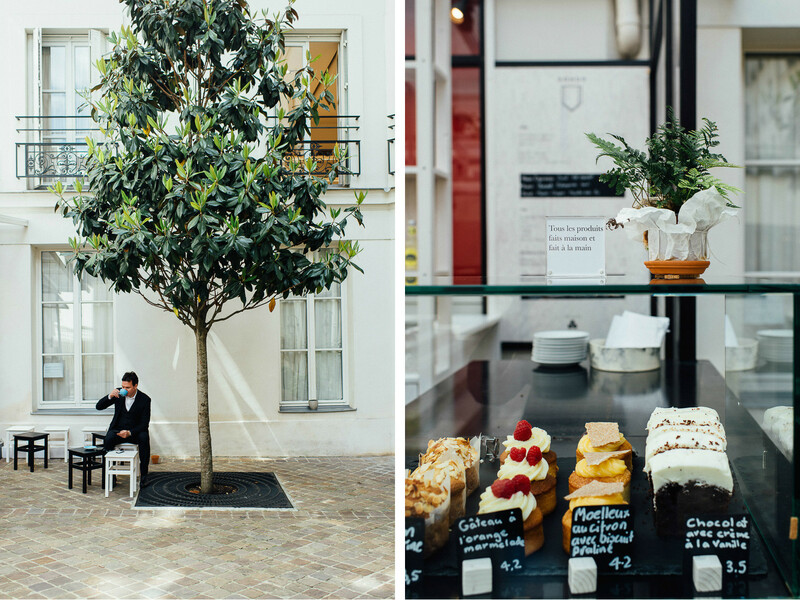 Travel & Lust reviews Paris’ well-loved Coutume Café. Written by Kate Robinson for the HiP Paris Blog. All images by Jean-Marie Heidinger. Looking for a fabulous vacation rental in Paris, London, Provence, or Tuscany? Check out Haven in Paris.